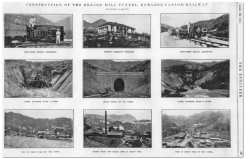 “The Beacon Hill Tunnel – Kowloon Canton Railway. Beacon Hill, about 1500ft in height, is part of a range of hills dividing Kowloon from the rest of the mainland. A tunnel through this hill was deemed necessary in connection with the railway from Kowloon to Canton, a distance of 100 miles. 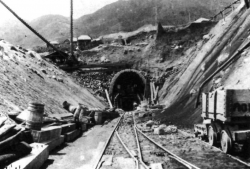 By reason of the Colony of Hong Kong being so intimately concerned with result of this project, the British Government undertook the construction of 23 miles of the line from Kowloon, the Chinese Government being responsible for the remaining length of the line to Canton. This article was first posted on 26th March 2014. Tai Po Kau railway station – dramatic film! 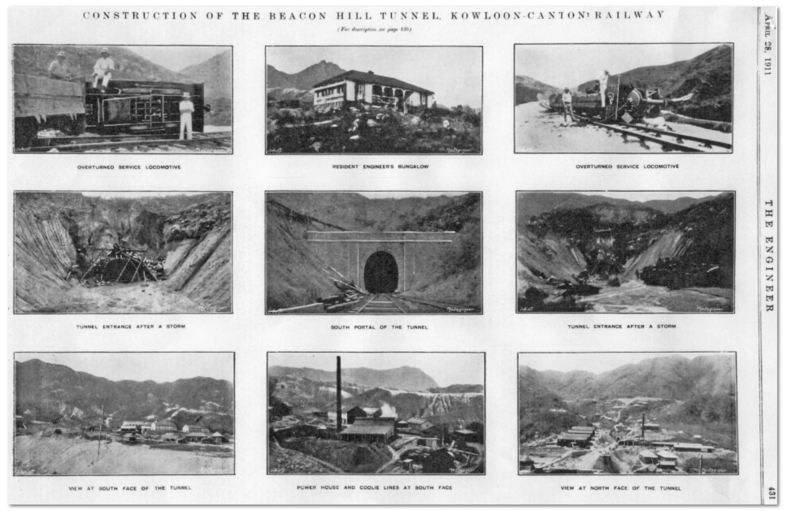 “Another 1980s abandonment was the original Beacon Hill Tunnel on the KCR. This modernisation seems to have taken place in the 1970s. Can the above be confirmed? And if so when exactly was the double track replacement built? And where exactly is the orginal tunnel? I think the modernisation started in 1974? The electrification went live (so to speak) in 1983 but when the old tunnel use ended I’m not sure. The tunnel is still there and if you walk up Cornwall Street it crosses the old track just before the petrol station. You can still see the tunnel entrance if you peer over the wall there. The physical track has gone of course but the ground where it ran is still there and serves as a (restricted) path to the old tunnel. I wonder why the orginal tunnel could know longer be used? Do you know about what remains of where the orginal tunnel exited on the northern side? The original tunnel was only wide enough for one track, so when the system was changed to use two perhaps creating a new tunnel big enough for two tracks was easier than adapting the existing one? As a young boy scout in 1966 I have the fortune of walking all those some 20 miles of KCR British Section with two companions. We took the last train to Sheung Shui and started walking South before midnight, we passed through this old Beacon Hill Railway Tunnel slightly up and then down and very stuffy (now we knew from above that there is a 2 degree curve) , reaching Yau Ma Tei Station before 0600 hours and before the First train due to start, the Station Master of Yau Ma Tei the late Mr. LIU Ting Fai who was also a Scoutmaster warmly received and welcomed us when we explained to him that we had walked all night from Sheung Shui that was why we had no train tickets for exiting the Yau Ma Tei Station ! I bet not many people had done that and it is impossible now with the new modern electric train and track.